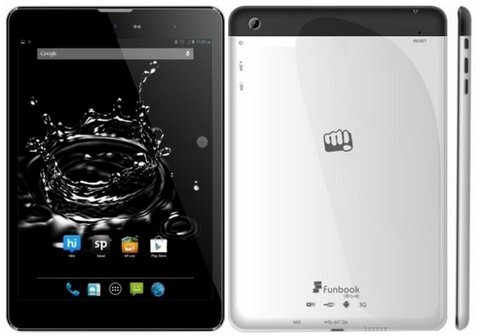 Micromax P580 Funbook Ultra HD is now avialable from online retailer Home shop 18 at very attractive price. The new Micromax Funbook Ultra HD P580 comes with some amazing specs. It features a 7.8 inch IPS display, 4-core CPU and a 5MP rear shooter. The P-580 tablet also supports voice calling via the in built SIM card slot. It would compete (vs) with P410 mini, Xolo Play Note 7, Tegra note and Canvas TAB P650. The new P-580 ULTRA has 7.8 inch IPS display with 1280 x 720 pixels resolution, 1.2 GHz quad core processor and 1GB of RAM. The tablet runs on Android v 4.2.2 Jelly bean and Micromax has preloaded some apps to make it more approachable. You can use the device to make video and voice calls. Micromax P580 Funbook Ultra HD supports UBS OTG via micro USB and 3G via SIM card slot. The battery of the tablet would not be that impressive, as it has 3600 mAh battery. It offers WiFi, Bluetooth, GPS / aGPS and FM radio connectivity. It packs with 5-megapixel rear camera and 2-megapixel front camera. The tablet looks similar to the CANVAS TAB and seems to have the same aluminum body.The company would soon launch there DUAL BOOT Canvas LAPTAB. The P580 Funbook Ultra HD is priced at RS 11,990 and is available in white with black color. It would be launched within couple of weeks.